Holly is the newest member of our family. This 2 yr old rescued pup came to us a few days before Christmas. Although, she is estimated to be 2 years old she only weighs about 5 pounds. 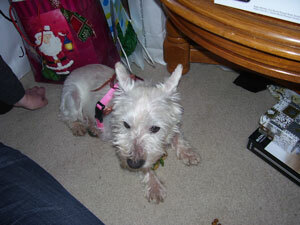 Holly gains more trust in us and learns about her new home each day. She has stopped quivering for the most part and now wags her tail when we approache her. Her favorite spot is the couch in the living room (which she can jump up on) or dad's lap on the couch in the family rooms as they both watch TV. Holly has had a very hard life up until now, living mostly outdoors (although she is house broken) and with an almost starvation diet (her hair is very thin in spots) it is a wonder that she has survived. Hopfully, with lots of love and caring, she will now blossom into all that she can and should be. Welcome Holly.